If you run the JOBO at 75RPM which is “normal” you will have higher contrast and loose some of the nice qualities of the film. I usually run a rotation test and find the best speed for the film and desired contrast… when using Diafine in the JOBO I run 2x the min chem amount and run around setting F which is the slowest it will run and get great negs… If I ran faster or “normal” the contrast would be too high… so just slow down the rotation AND double the chem amount…. 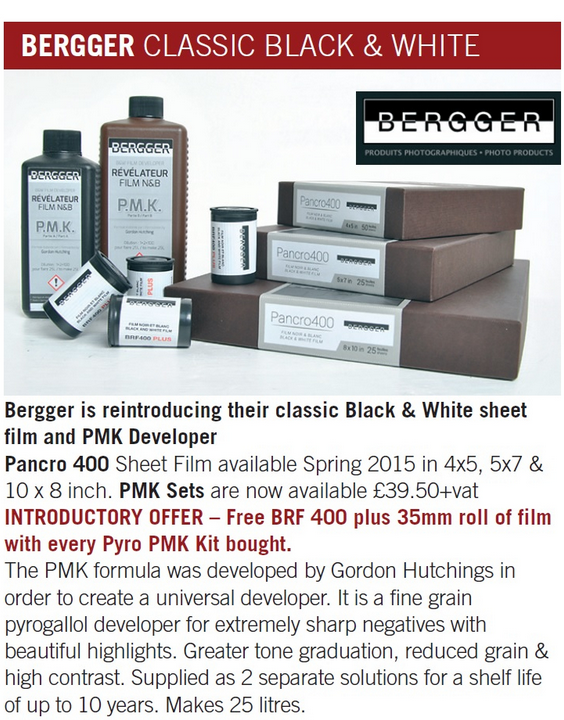 NOTE: this will not work with the PMK kit… for most other developers yes but please do test first….. So, in terms of film characteristics and emulsion this is the same as their 35mm film? Blimey, it’s so nice to see that there is something going on in the film scene again! I have no idea. I have sent a note to my friends at Bergger and hope to get some info this week… If it is the same it would be fantastic! Their PMK kit is already available at Maco, for people in Germany/Europe. Maco doesn’t stock the sheet film (yet), though. Thanks everyone for your replies. Has anyone scanned a PMK developed neg? What were your impressions? I have not of the new film but lots of other PMK dev negs from dozens of different films… I suspect it will be a good match at EI of say 160 -200… really hoping to try some soon! PMK is easy to scan and has an amazing long range with wonderful highlights and very fine pleasant grain….